Made by Genalex in 1948. 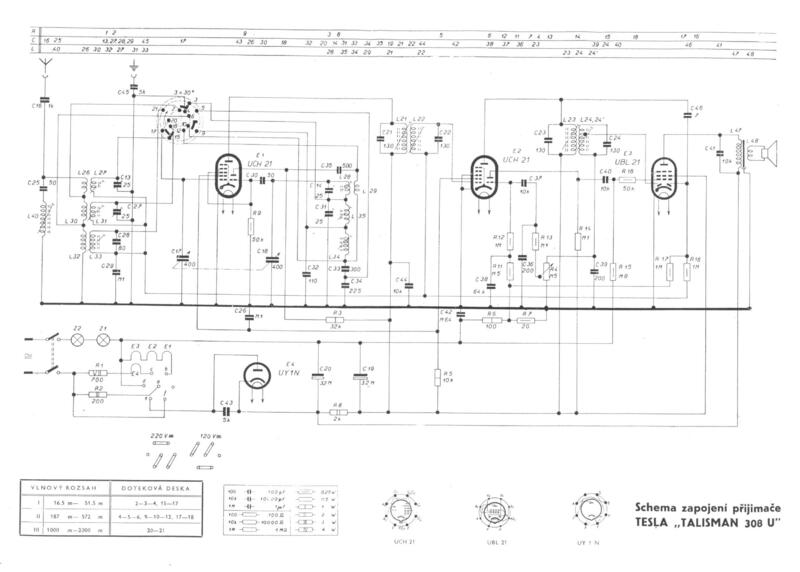 Genalex began in 1939 and made electronic equipment up until 1958. 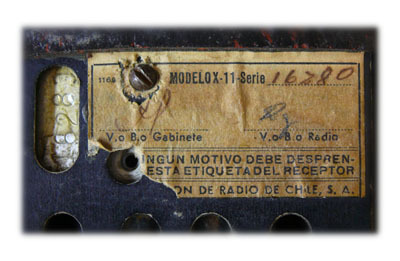 It was typical of many vintage Argentine radios to have no manufacturer markings other than the bakelite cabinet and the chassis stamped "Fabrica de Argentina". Although only half the size, a very similar design to the US-made Belmonts and the Aussie Technico Aristocrat. The cabinet is made of chocolate brown bakelite. 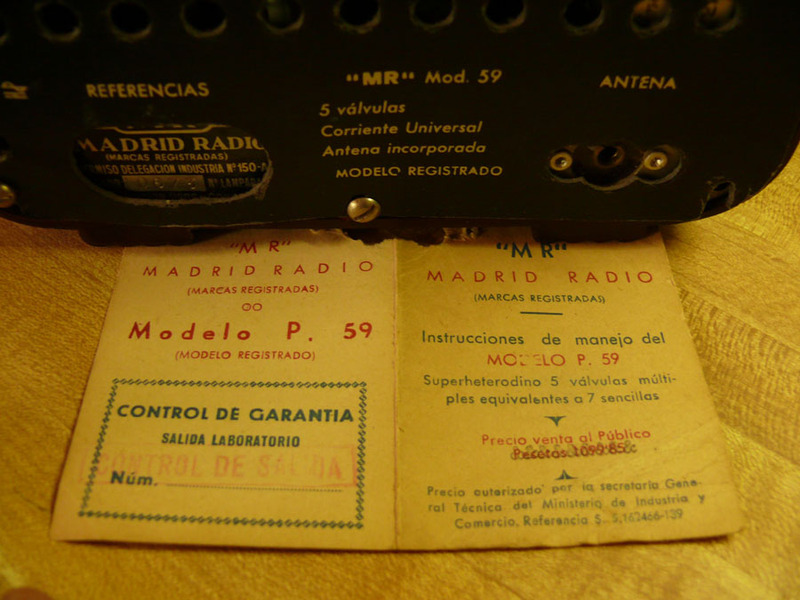 although many companies in Argentina manufactured radios; Philips, Zenith (assembly only), Dumont, Westinghouse, Radio Serra, Noblex, Tonomac, Radio Victoria, Admiral, Genalex, Grundig - to name a few. 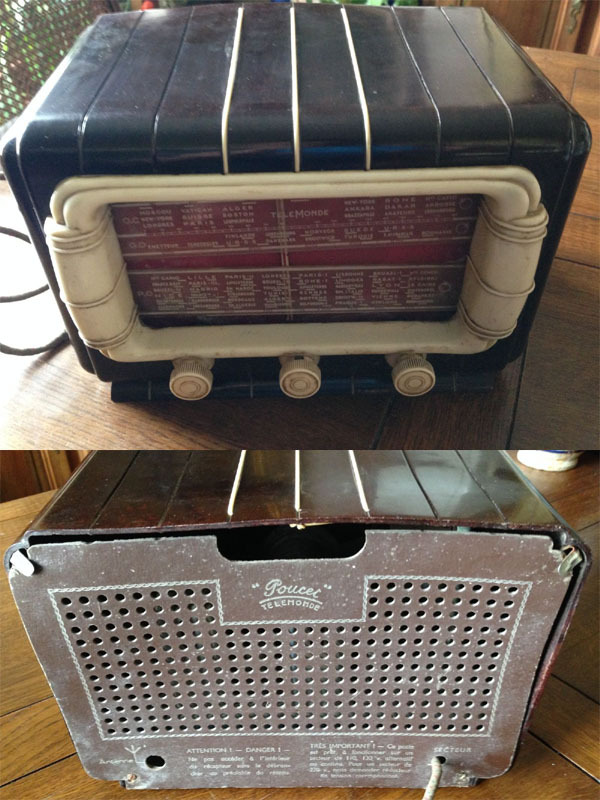 Eumig model 326, made in Austria, a small (9"w x 6.5"h) 2-piece brown-mottled bakelite radio. The center dial is reverse-painted glass and the escutcheon is made from a separately molded bakelite piece. The Minerva model 376 was made in Austria. 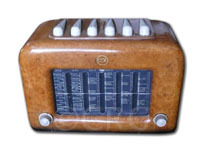 It is an impressive, large wood radio with fabulous wood grain patterns. 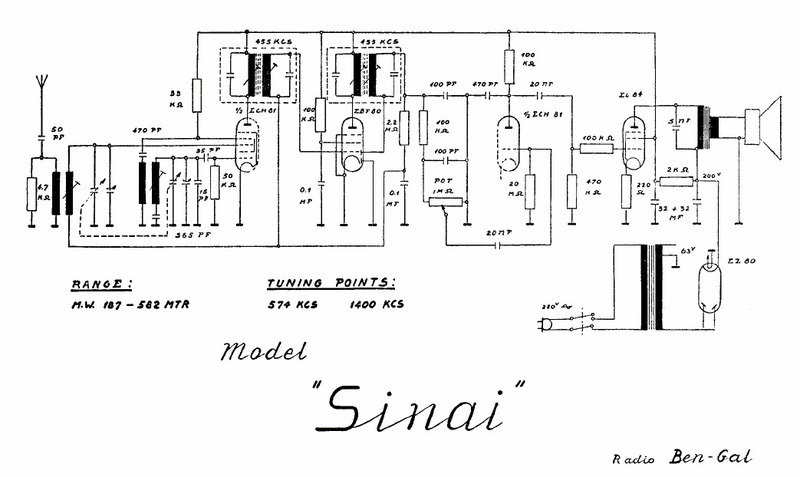 It was made in 1936/37 and featured a "magic eye" tuning indicator tube, and a unique tuning knob found on other Minerva models. Minerva was founded as Radiola in 1924 by Wilhelm Wohleber in Vienna, using the names Radiola, RadioGlobe, Aeriola, Aerophon and Radiopa. 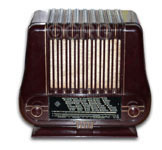 To avoid problems with large corporations using these names; Radiola by RCA in the USA and France, and Aeriola by Westinghouse, Wohleber changed the name to Minerva in 1927. Minerva flourished all the way through the late 1960s. For more history on Minerva, try this link. The model X-11 "Aladdin" ("Aladino") is a small 3-part bakelite construction, with the "bookends" sometimes found in white. This is one of the world's most ubiquitous radios, due in part to 1 million that were made in a nearly 10 year run in the 1950s. Date stamps on chassis parts tells this example was built in mid-1959. 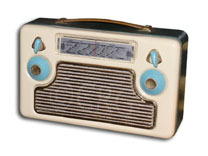 It's fabulous design would suggest it to be a mid-40s radio. Another reason many survived is that the cabinet was very well made with very thick bakelite. It was available in black, brown or burgundy. 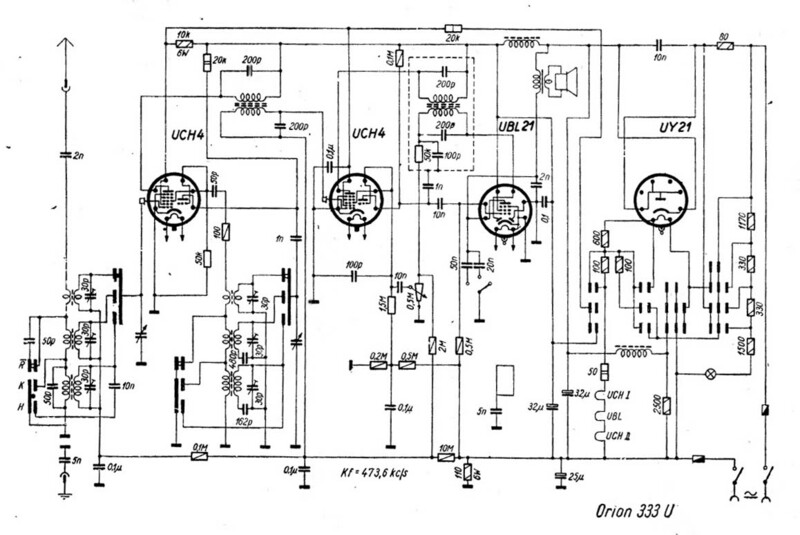 The 4-tube, 3-band chassis was also high quality. 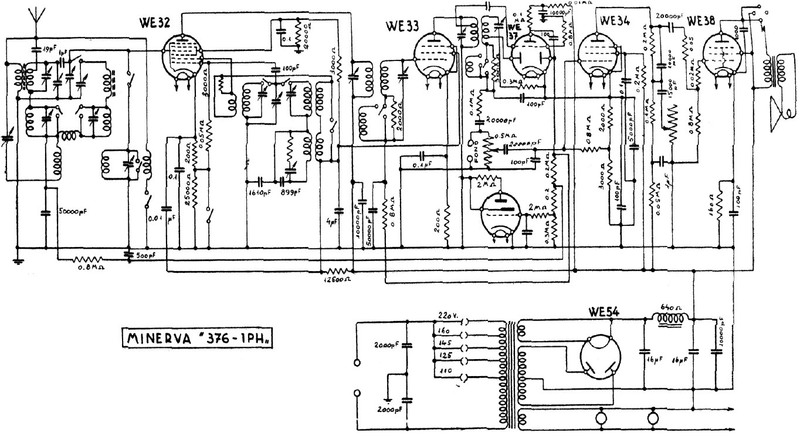 Philips type BX 422 AB. Full brown bakelite case portable, AC/DC, 1952. Philips type BX 195U. Brown bakelite cabinet, 220v, 1949. The nicely designed portable Terta BA408F was made by Telefongyar in 1958-59. Interestingly constructed of metals, wood and plastics. trimmed with a translucent white surround that beautifully lights up on the sides of the dial and the red button below the dial. that uses the same cabinet and dial surround, but with 3 knobs and a different dial configuration and rear cover. The reverse painted dial glass lists Middle East and European cities, and the back of the radio lists the specs in English and Hebrew. Magnadyne model S20 (1954). A wild plaskon grill design surrounding an unusual double-dial. 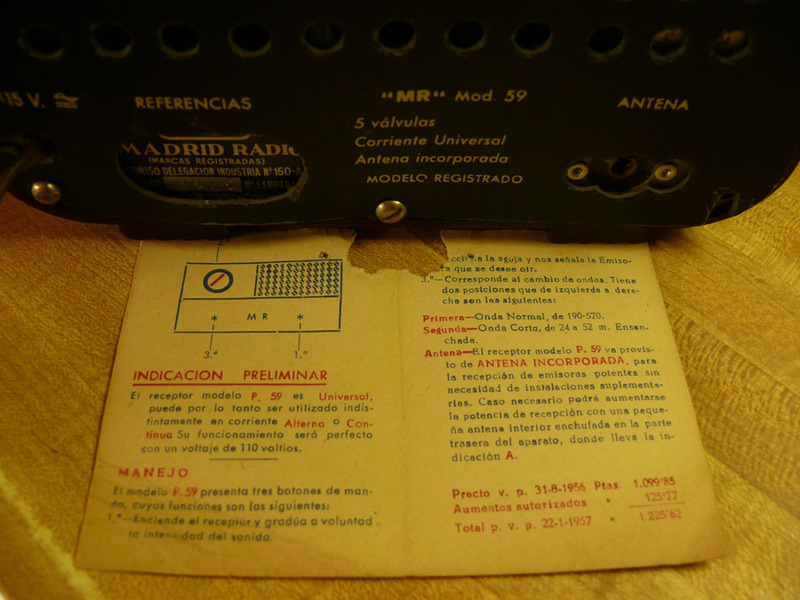 RadioMarelli Model RD150. An interesting design with inset volume and tuning control knobs, made of white plaskon, in Italy, probably in the early 1950s. 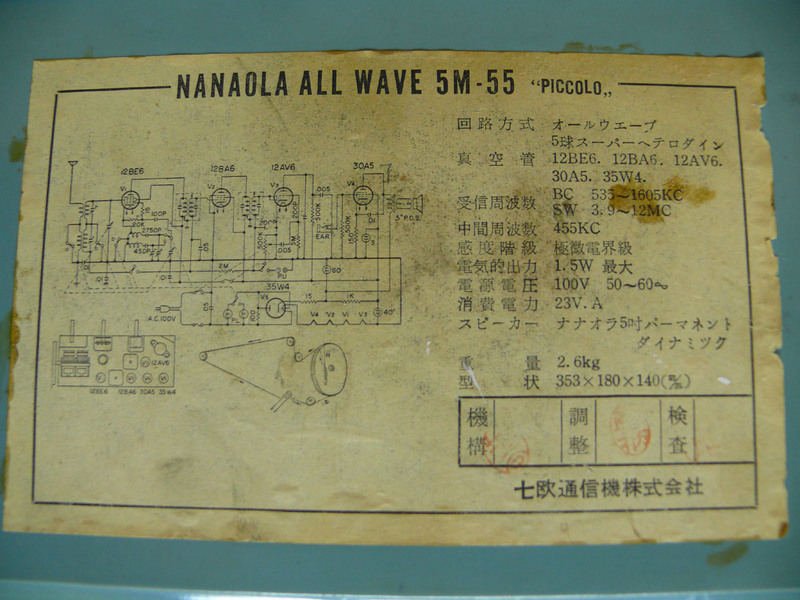 The rare Nanaola model 5M-55 "Piccolo" was one of the last tube radios and featured both AM and Shortwave bands. The wild design immediately caught my eye with the Jetson's styled cabinet and slanted dial. 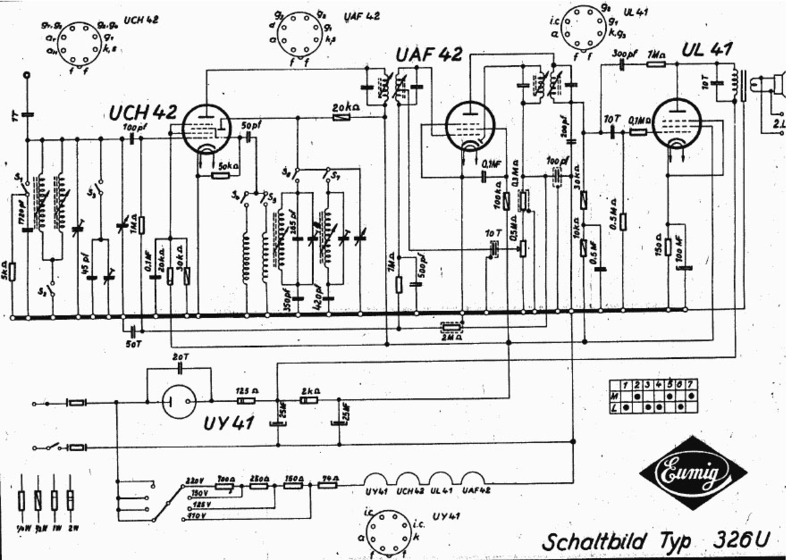 As transistors took over the US tube market in the late '50s, Japan continued making tube radios into the early '60s. 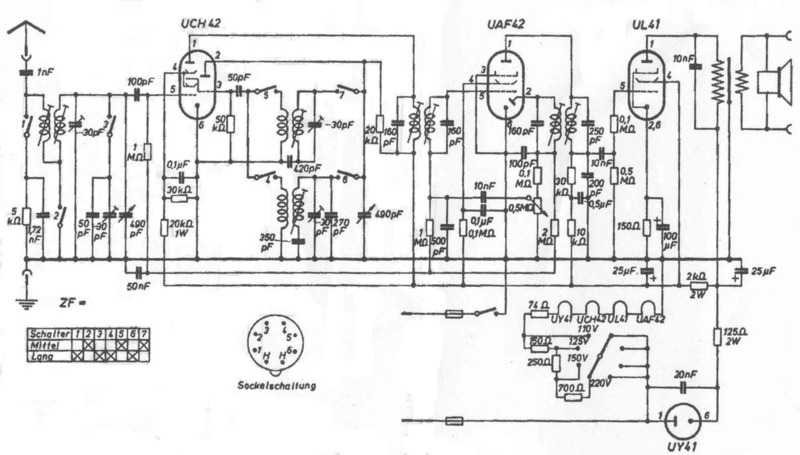 by substituting out the 30A5 output tube with a 50 volt tube to drop the additional 20v. In the early '60s, Japan also made transistor radios. 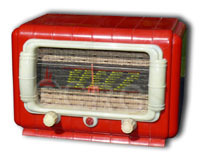 The 6 transistor Channel Master model 6511 has "Jetson" style cabinet similarities to the Nanaola tube radio above. These were imported into the US and are fairly common. It is a battery set, using 4 D-cell batteries. These tiny 1960s tube radios came in many colors with many grille and knob variations. They were made for the US market with dozens of different names on them. 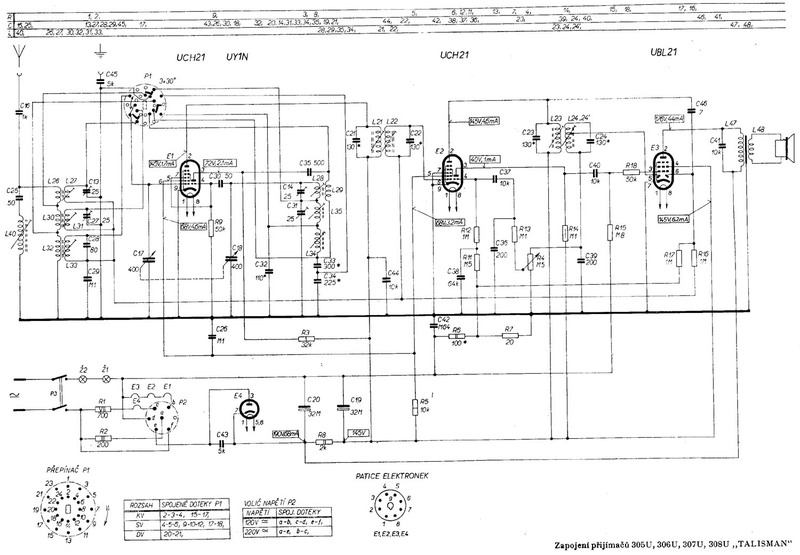 Russian speaker "radios". These were not actually radios, as they could not be tuned, but were plugged into wired Russian government broadcasts. Both black bakelite cabinets have great sunrise designs. The round one is very small, measuring just under 6 in (15cm). Most Russian speaker models were intended to hang on the wall. 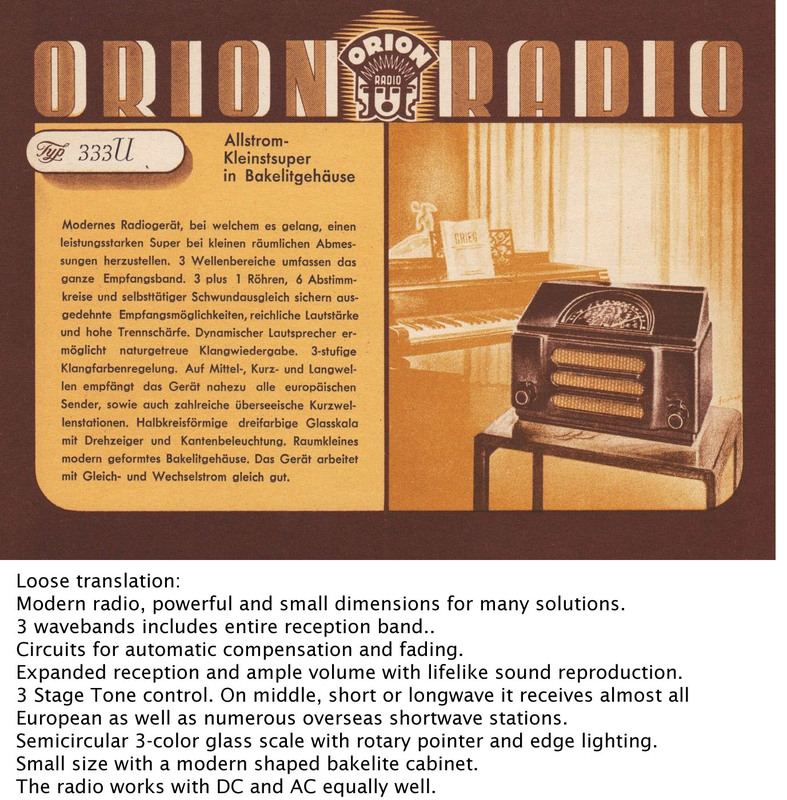 A fabulous midget radio, only 6½ inches wide, with an incredible starburst design radiating from a reddish-orange reflective dial. The white plaskon facade is surrounded by a dark bakelite cabinet. The unique knobs have pearlescent caps. Radio's paper page 1, Radio's paper page 2. The Vica 400 has a wood body with a wild white plaskon face and large round reverse-painted glass dial. 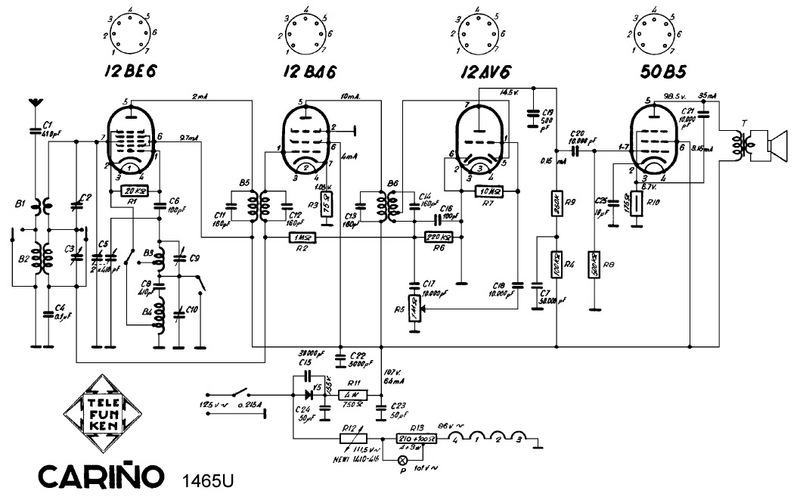 VILOR was an electronics company from a little town called Follos, near Valencia. The Vilor name is derived from Vicente López Rosat, the company's founder. The factory no longer exists. 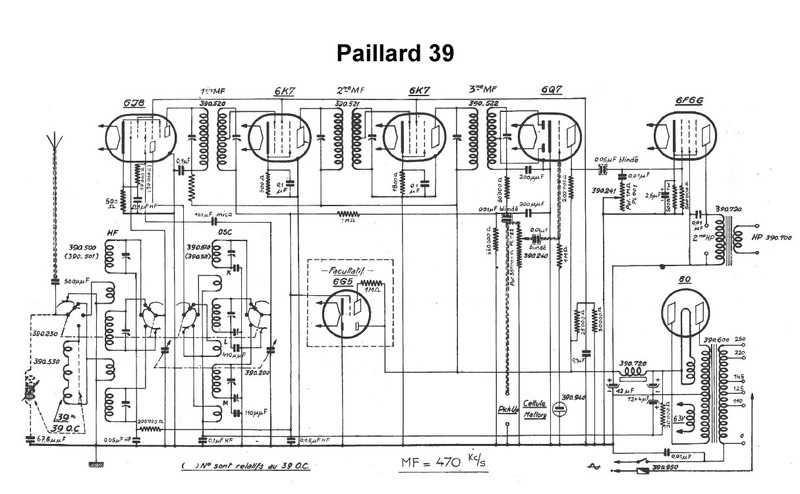 Paillard was a Swiss company founded by Möise Paillard in 1814. They began making music boxes and in 1898 they started producing their first cylinder gramaphones, the Echophone. Then, in 1904 began building disc gramaphones. Through the years, they also made radios, clockwork motors, Hermes typewriters and the well-made Bolex cameras to name a few. but the merger only lasted 3 years. 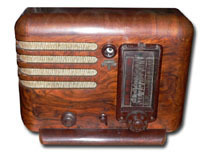 Paillard was located in Yverdon, Switzerland and the reknowned Swiss craftsmanship was evident in all their endeavors, including this 1938 well-built 3-band radio, the model 39. Beautifully designed with chrome bars and a blue painted metal cabinet.